There is lots of excitement right now about the prospect of NE Ohio shooting for the movie version of My Friend Dahmer, the excellent graphic memoir by local cartoonist John `Derf' Backderf about his real-life high-school comradeship in the 1970s with Bath Township resident and future Milwaukee serial killer Jeffrey Dahmer. Ohio badly needs a new economic base; serial killer nostalgia in movies may as well be it. Or does anyone doubt for a minute we’ll someday get a flick about the early years of “Buffalo Bill” from SILENCE OF THE LAMBS (a Columbus resident, as readers of the novel will remember)? But is there a more genteel alternative? Quietly, without much hype (or mass-murderer trading cards), there’s another wave of film production taking place here, for the TV marketplace. And also adaptations of top-selling books. And no, not Thomas Harris ones. 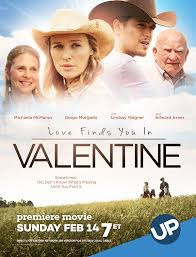 LOVE FINDS YOU IN VALENTINE is the first one, based on novelist Irene Brand’s hit Love Finds You in Valentine, Nebraska, which became a frontrunner in a whole subgenre of regional romances promoted in association with the religious digest Guideposts. I doubt there are a lot of subscribers to Guideposts who have also read My Friend Dahmer, but trust me, the marketplace out there for faith-based romantic fiction is enormous. And somehow the Cleveland Film Commission nabbed the Irene Brand property away from shooting in Nebraska (or that old fallback, Canada) to lens in Ohio after all. Maybe they promised the whole Guideposts staff would meet LeBron (or Machine Gun Kelly). Well, LOVE FINDS YOU IN VALENTINE is on video now – note the state conspicuously dropped from the title. Young Kennedy Blaine (Michaela McManus), a rising young California lawyer, inherits a failing ranch following the death of her widowed father, who once fled the area in a Romeo-Juliet situation with Blaine's mother, a headstrong girl from the enemy Morgan clan. Kennedy's plans to sell the homestead to an unseen buyer are derailed when she finds the place has been misrepresented as bankrupt. The ranch is actually thriving (most un-Ohio-like if you ask me) under management of a macho cowboy (Diogo Morgado) and the family that adopted him off the mean city streets. Kennedy is torn between her own city-slicker upbringing/boyfriend, now so far away, and the small-down values embodied by the town of Valentine. Director Terry Cunningham shoots it all in Holmes County in solid if off-the-rack Hallmark Channel fashion. Yes, plotting comes close to a Snidely Whiplash manqué practically tying our heroine to the railroad tracks, but the Red Stater demographic who watch/read this sort of chaste romance and elevation of traditional Americana and churchgoing aren’t looking for “edgy,” and no reason why they shouldn’t have their fair share of the entertainment spectrum either. The late Gene Wilder gave an interview in which he said he didn’t make a movie in his last 25 years simply because he found all the violence, profanity and sleaze in the scripts he was brought just plain unappealing. I am not exactly a Tea Party member, but I can relate. And it’s a treat for longtime viewers of the Cleveland movie scene to see veteran Parma actress Annie Kitral as Ed Asner’s secretary, plus names in the credits of local filmmakers such as Adam White and David Litz who have long paid their dues in the trenches. I am given to understand that LOVE FINDS YOU IN SUGARCREEK, OHIO, the movie version of another book in the series, has also been done in the Buckeye state, with most of the same people and no disguising the Amish-area setting. No, these movies won’t earn Best LGBTQ/Heroin Addict/Serial Killer Lifestyle Depiction Award from the Cleveland International Film Festival, but they’ll bring jobs and money into the Ohio film racket, and that’s good.